When purchasing you will be asked to create an account. By creating an account, you will always have access to your e-purchases. Simply log in to your account on my website to access these after purchase. 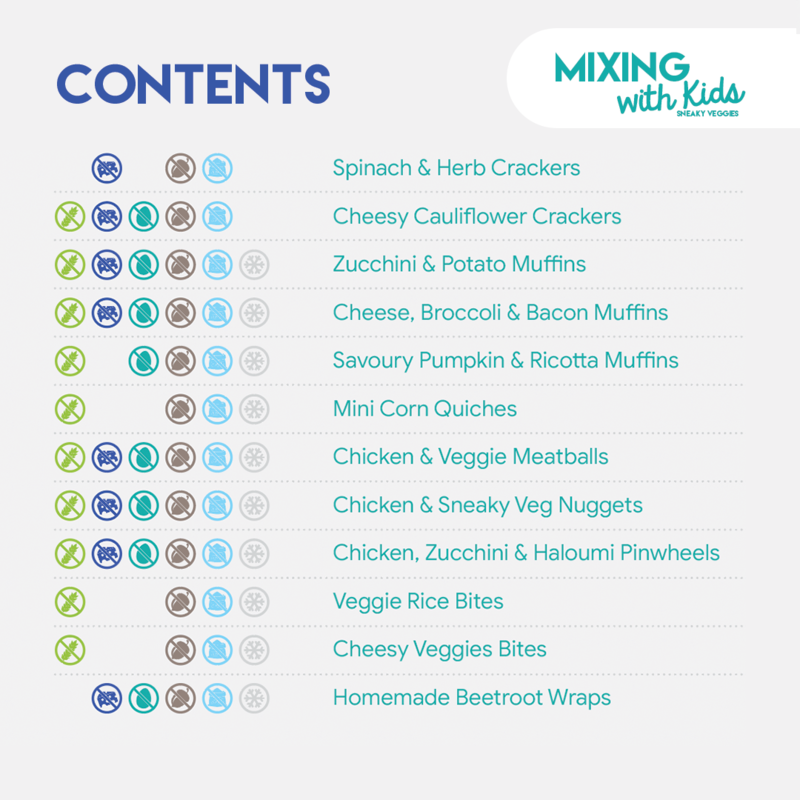 Mixing with Kids is FOR Kids! 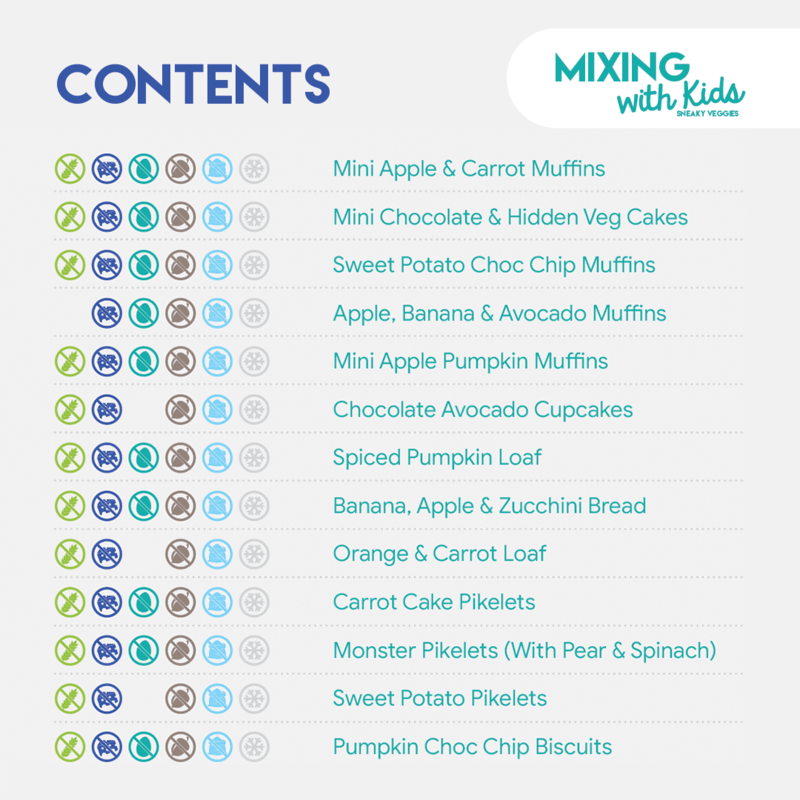 The recipes within the book are designed for kiddies to get into the kitchen and cook up a storm (with an adult supervising of course. Every head chef needs a sous chef!). The book contains 25 delicious recipes and includes both thermomixing and traditional methods so no one misses out. 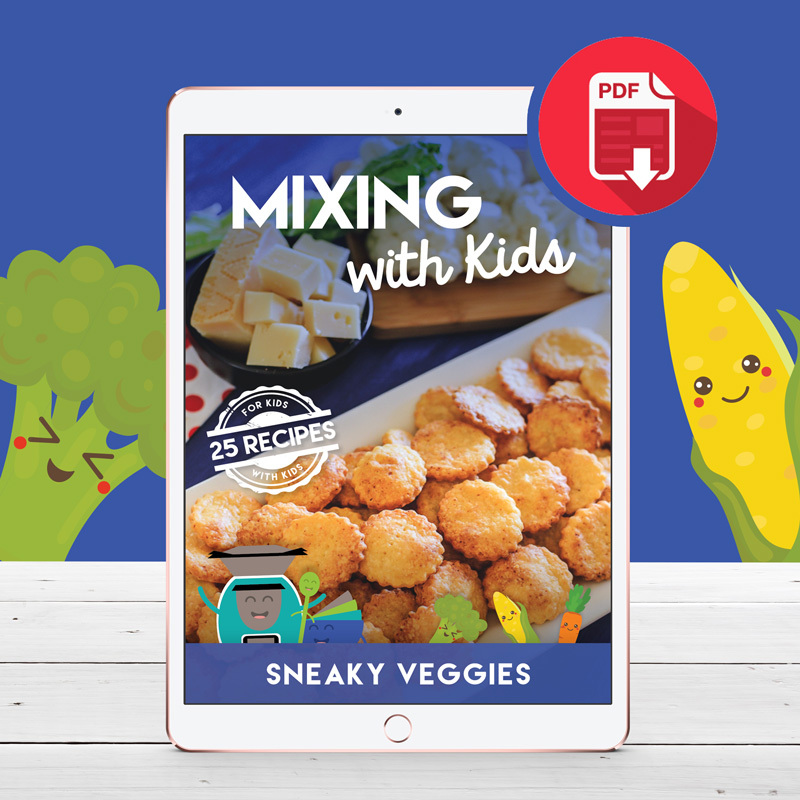 All recipes include sneaky ways to add veggies to them – even the sweet ones! 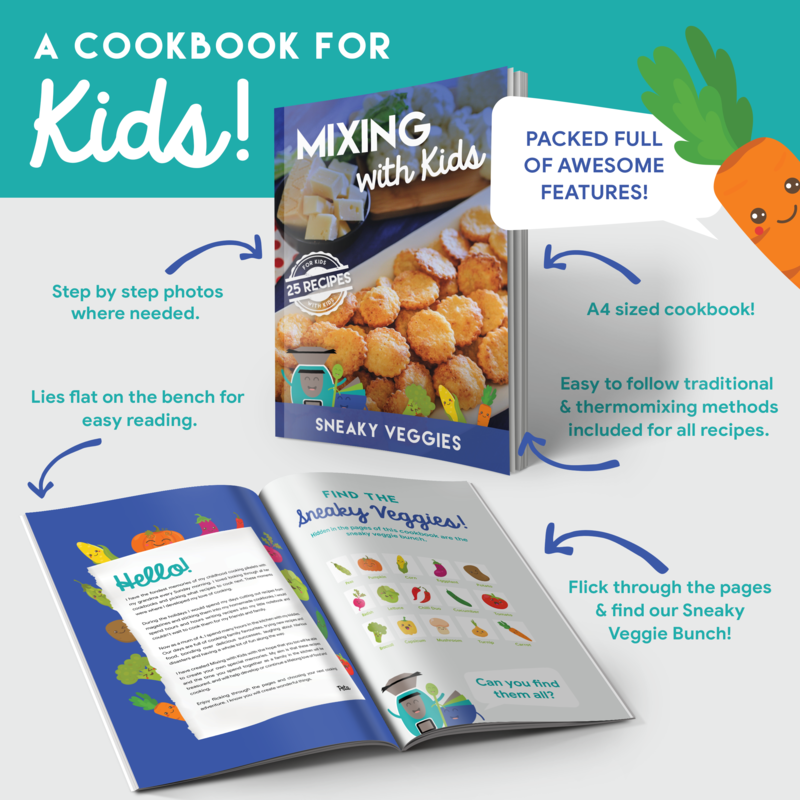 My veggie hating 5 year old is the inspiration behind this book and its safe to say almost all of these recipes in the book get his tick of approval – now that is saying something! Allergy information and variations are included in the book however user discretion is essential. I have the fondest memories of my childhood whipping up recipes in my grandma’s kitchen from her homemade cookbook, cutting out and saving recipes from magazine and creating my own cookbooks. I have created Mixing with Kids with the hope that you too will be able to create your own special memories. My aim is that these recipes and the time you spend together as a family in the kitchen will be treasured, and will help develop or continue a lifelong love of food and cooking. Price is in Australian dollars and is inclusive of GST. Price includes postage. When purchasing you will be asked to create an account or log in to your existing one. By creating an account, you will always have access to your e-purchases should you misplace them, change devices or the order confirmation gets lost in cyber space or blocked. You can access these at any time after purchase. After purchasing a print copy of Mixing with Kids: Sneaky Veggies, you will receive a link to your e-book in your order confirmation email. It is extremely important that you write your email address correctly in the order details box so the email reaches you. It will also be displayed on your order confirmation screen. We highly recommend saving that link immediately. Once again, you can access your purchases at any time in your account. © Copyright 2019 Recipe Creations Pty Ltd. Recipes and images are protected by copyright laws. 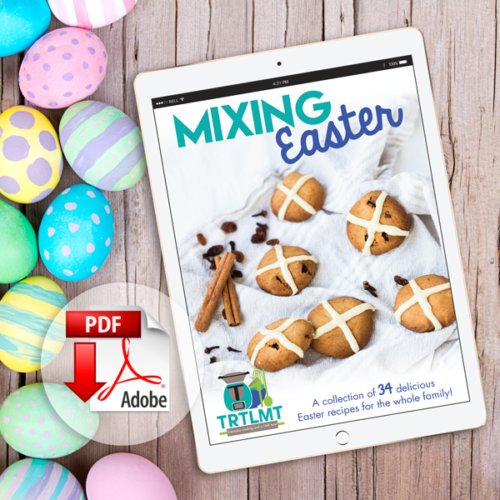 No part of this publication is to be reproduced, published or transmitted in any form without permission from Recipe Creations Pty Ltd. Exercise caution and common sense in the kitchen at all times. 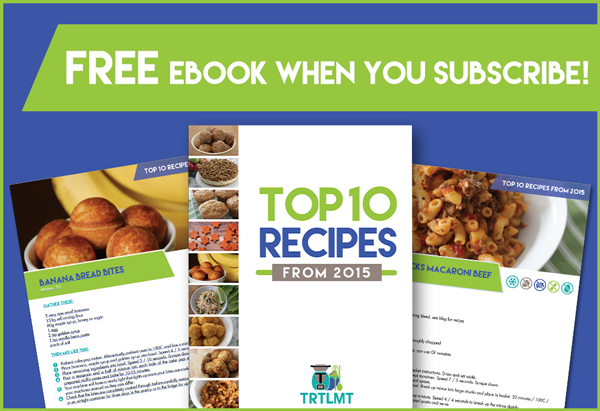 The recipes in this cookbook are designed for families to cook together. Adult discretion, supervision and involvement is vital. 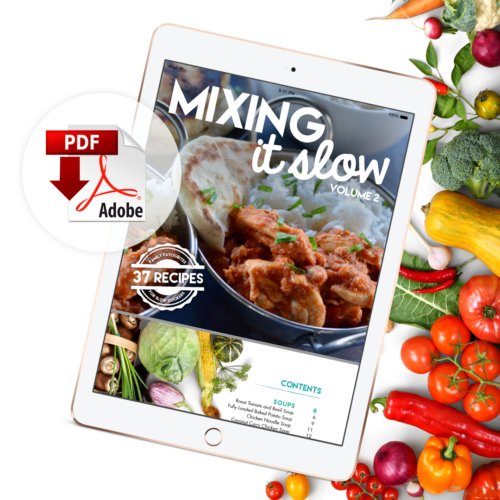 Before commencing any recipe in this cookbook, please be sure to read and adhere to the user guides and safety manuals of your thermo mixer and/or other appliances used throughout the cookbook. Recommendations and guidelines can change, so be sure to stay up to date with your company of choice. Each appliance differs; therefore, the recipes and methods are to be used as guides only. In the instance that something lamentable occurs to your machine, your property, yourself or members of your household whilst undertaking my recipes, I will not accept responsibility for any damages. Every effort has been made to ensure that each recipe in this book is accurate at the time of printing. However, I accept no responsibility for any inaccuracies that may arise. Storage and cooking times are conservative and are a suggestion only. Use your own discretion when cooking and consuming any food. Refer to your local food safety authority for up-to-date information on correct cooking and storing of food, particularly meats and dairy products. 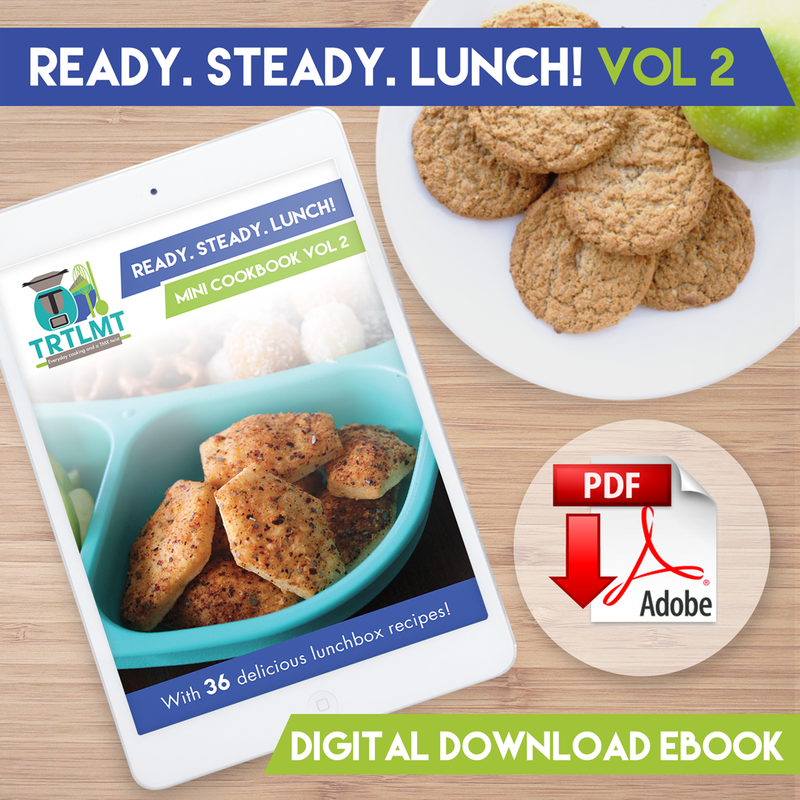 Recipes found in this cookbook may appear in future publications or websites.